Gullwing America who specialize in tuning the Mercedes-Benz 300SL have planned a new project that was ordered by a customer from Europe. The customer requested an exclusive one off sports car design. 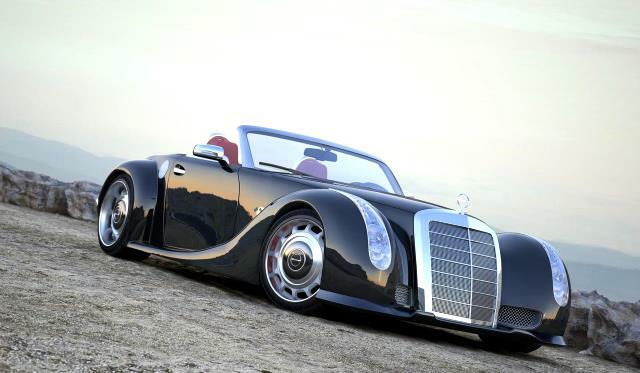 To achieve this, the GWA team selected a 2012 Mercedes-Benz SLS Roadster (R-197) as the base for their project. The end result will be a 21st century 300 SLC, a convertible roadster with a removable hard top. GWA has decided to create a handmade aluminum body, which will be modeled on the 1955 Mercedes-Benz 300 SC (W-188), only 92 of which were ever produced. The body will receive some modern touches including changing the position of the pop-out rear spoiler and modernizing the headlights with LED’s. The grille was redesigned with an assertive, yet elegant, slant and illuminated emblem on the top. The GWA team will then fit it with a special exhaust and a height adjustable suspension. As for the wheels, they will utilize their very own GWA Evolution wheels sizing 21×9.5 inches in the front and 22×12 inches in the rear. They will then be wrapped with Continental tires. Of course, the project is in its early stages at the moment. Hoepfully we can bring you photos of the finished project in the near future!